5, 4, 3, 2, 1….. and we have lift off! 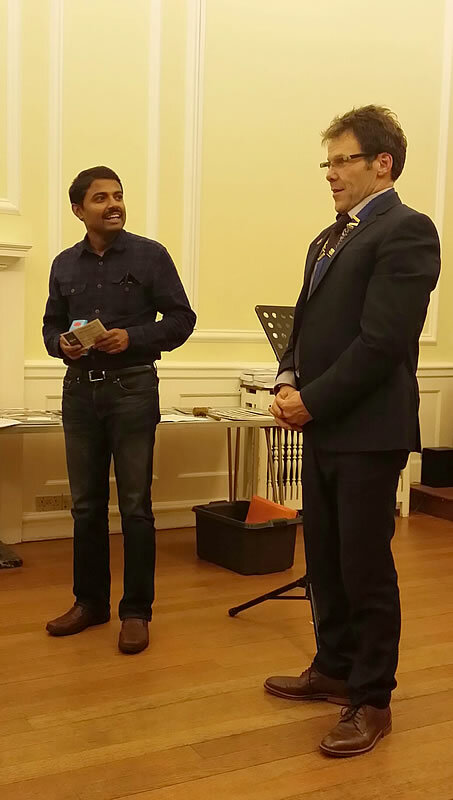 As he receives his award for best speaker of the evening, Vinod Venkatanarayana offers some praise to Club President Richard Green. President Richard Green reviews the meeting at Ripley on 20th November. “5…….4…..3……2……1. you may put down your pens”. Not my words, that of our timer for the evening and what a great time we had too! Another epic evening at Ripley! Guy Dessoy our new Sergeant At Arms let us have it at 7.30 sharp. The opening went to plan. Phew! The Club President sat calmly in his chair. Not only was the program correct, without last minute cancellations, but Richard knew this was all under control. Gone were the days of chaos theory as our super suave Dave Henson took the helm as the Toastmaster of the Evening. Wow, he looked the part. Dark suit with charcoal open necked shirt. He certainly walked the walk, could he talk the talk? Absolutely! Dave was competent, confident and polished as he delivered an almost flawless display and a thoroughly enjoyable evening. Very well done indeed sir and a huge thank you from myself and everyone for a great fun night. Step into the limelight Paul Goodhill our timer, always a delight and thoroughly entertaining. Paul kept us on time with military precision, except on the odd occasion when he nodded off, eh em, titter titter, only pulling your leg sir. Thank you Paul. However, we did finish 1 minute 53 seconds late due to the Club President not wanting to go home. Our Grammarian Alison Morey was a delight too. We learnt so much from a very comprehensive account of our parlez. Now I do not want to sound ‘dogmatic‘ but how does one shoehorn all that which has been conveyed well into those four tiny minutes – easy, take seven and a half! Hahaha. Very well done Alison for illuminating our evening. Our VPE Patricia Caesar gave us a deep and meaningful hot tip. “Be yourself, be genuine and be authentic. Brilliant Patricia, thank you – I’ll give it a go! We were then all warmed up by the illustrious Karen Mefflin. “If you could design a website.” There were lots of ideas flying around and I am sure the nabobs in the room were making all sorts of notes. Thank you Karen. Our first prepared speech was delivered by the debonair Alex Clark, who started his journey by delivering his icebreaker. “The Emperor Napoleon the Third” Where are we going with this, I thought. Then Alex said they were both exiled in Chislehurst – great; then on to a naked civil servant, what? Say no more. Thank you for a very interesting and articulate speech with lots of twists and turns. Very well done that man. Then Vinod Venkatanarayana, (hang on my spell checker has gone into melt down) entertained us all with a thoroughly humorous speech about feeling the fear and doing it anyway. Having babies that is – no not Vinod, his wife, silly. An excellent speech delivered with advanced skills which were extremely engaging. This chap has so improved in all areas of public speaking you know. Then to our final speaker Mr Neil Pettigrew. I must say that I thoroughly enjoyed this wonderful speech, expertly and naturally delivered in a conversational style. We all had a chuckle when we saw Neil as a young bus conductor. It brought back childhood memories, hopping on and off buses with our red rover passes, generally misbehaving, so what’s changed now Richard? Thank you again Mr Pettigrew for another hugely entertaining speech with a brilliant message. Life is a rich tapestry, get out there folks and sew! I love stories like that. Our evaluators were Ian Brett, yours truly, and Evelyn Khan-Panni. Three experienced evaluators. First came the gentle support and encouragement, then the recommendations or improvement points, finally the conclusion, a real commendation lifting the speaker and inspiring the audience. All three came through with huge aplomb. Well done! Table topics, what a scream it was too! Friendly challenging questions, sensitively put to each and every speaker by our very own Area Governor and previous president, Jenny Taggart. I had to laugh when Mrs T asked Neil Pettigrew should his wife be his best friend or best lover. Get out of that one Neil, I thought. True to form, came a brilliant retort. Buy me a pint and I will tell you what it was. Hahaha. Neil once again walked off with best table topic speaker. Curtis Christie was our TT evaluator. I was so impressed when Curtis delivered a much improved evaluation of eight table topic speakers. This chap has come on in leaps and bounds and so engaging with his heart warming smile. Keep it up Curtis. Our General Evaluator was Tony Babatunde another previous President. What a man! Always ready to help the club with his passionate, energetic overview of the evening. Thank you so much for your wealth of experience Tony. What was that, there was no club recommendation? Tut tut Tony, for such an experienced Toastmaster. We previously had a beautiful tip about moving our chairs together so as to allow our speakers to formulate good eye contact and it worked beautifully. Never mind Tony, put it in the post. Please, please, please all you budding GEs let us have your club recommendations like the above, so we can improve, you see. Finally over to Mr. President for a little bit of fun and a round-up of a truly beautiful evening which I have to say was incredible and very funny too. Thank you once again to everyone who took part. Bonfire night had come and gone! You could have fooled me as there were plenty of sparks flying at Ripley! Our transformation to using the D71 portal is giving more shocks than a box of fireworks. Come 4.30 on Thursday Patricia our VPE lit the blue touchpaper. Now everyone stand well back!! Our Sergeant At Arms Anthony Smith jumped in and opened the meeting. We are off! Tony was standing in for Guy Dessoy who took over from Peter Bull – yes one of those nights. The usual ramblings by our club President led us to our top guy folks, Ian Brett. Ian was coerced at the very last minute to stand in as our Toastmaster of the evening. A massive thank you to Ian who produced another sterling performance as our acting Guy Fawkes, a job well done with huge aplomb. Ian led the meeting extremely efficiently and we all knew we were in for a blast. Eddie Barnes gave us a brilliant hot tip: “get out there and do it” and speak to other clubs, organizations and gatherings. It’s scarier than a dark alleyway on Halloween but it sooooo broadens your horizons you know. Thank you Eddie! Alex Clark warmed us up with a real sparkler: “what was the first record you bought?” Gee I felt old when I said Mungo Jerry then someone mentioned Neil Sedaka. Phew, I was off the hook. We were ‘enchanted’ by our grammarian Julie who lit up the evening and gave a thorough report on our parlez (you know what I mean). Our two speakers were extremely entertaining, delivering high standard speeches with hidden messages. Albert Akhende with “Merchison Falls” a beauty spot in Uganda. Watch out for the flies though and the economy option may not appeal to everyone. Karen Mefflin, an advanced speaker, rocked and rolled us with her Michael Jackson story. “Billy Jean is not my love….”. I still have that tune playing in my head and I am polishing up on my moon dance. Thank you Albert and Karen for two excellent speeches. Eddie Barnes doubled up and evaluated Albert Akende. He is a clever stick like that and delivered a thoroughly clever evaluation, highlighting what Albert did well and how Albert could have lit up the room. Well done and thank you Eddie. Always good value when Dave Henson evaluates. He is a super evaluator. Dave gave some uplifting commendations and hit the spot with clever recommendations. Our two evaluators displayed the art of good feedback. Yes, the speakers learn, but by demonstrating their recommendations, the whole audience learns. Our VPE Patricia Caesar led the Table Topics and threw out some whacky challenging questions. Now ladies and gentleman, there are three things we try to avoid discussing in Toastmasters, politics, religion and things of a sexual nature. Patricia blew that philosophy wide apart. Well bully for you girl because we all have to deal with some tricky things in life and we witnessed an artful display by our table topic speakers. Royston made me chuckle when asked what was his favourite colour. He used a brilliant delaying tactic….can you repeat the question please? No he could not believe it either! Sometimes the simple things in life can just throw you. Very well done to all our table topic speakers! Our guest Tracey Seed walked away with top spot. Wow she certainly showed us how to handle a mind bending question. Pause for a few moments, hold the pause….think, think, think,…. then boom let it fly. I learnt a lot from that in a subliminal way….catch my drift. Our Table Topics speakers were evaluated by Vinod Venkatanarayana, another fine evaluator who carefully went about his business giving recommendations where he could. It’s not easy, with many speakers, to find recommendations for all. Finally our evening was completed by our General Evaluator, Evelyn Khan-Panni. This evaluation and feedback was extremely valuable to our speakers as it was to a very high standard. Recommendations to all with a beautiful club tip to re arrange our room to help us focus our attention on our audience not to an empty space in the middle. Every now and then we all need that proverbial rocket and Evelyn certainly let us have it! Thank you Evelyn. Back to the President for a roundup of a thoroughly enjoyable evening. Patricia – the D 71 portal can be our friend, if we use it that is. Please if you are looking for a role and I know you all are, it’s the only way to learn in this business, then sign up today, now, quick the speaking slots are going fast! Next time our room will be arranged differently. Oh yes, watch this space! Thank you everyone and I look forward to seeing you at our next meeting on Thursday 20th November.